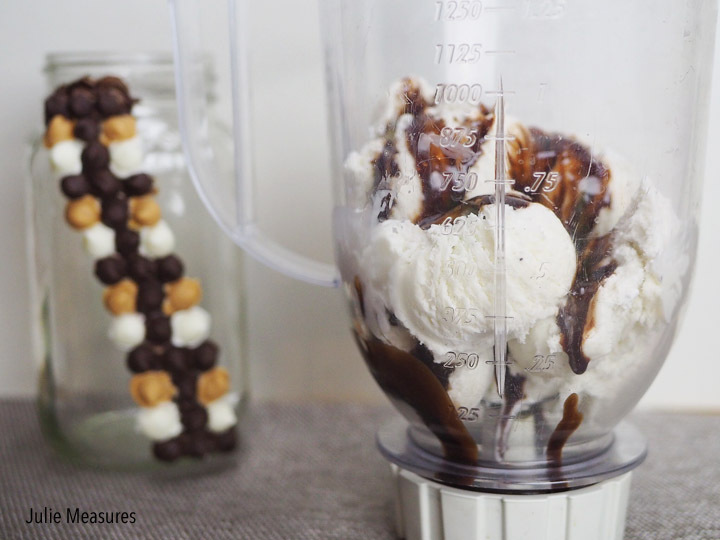 Celebrate Han Solo, Chewbacca, and SOLO: A Star Wars Story with this Wookie Chocolate Milkshake! Want to know how to make your teenagers incredibly jealous? Tell them you are going to see Solo: A Stars Wars Story without them. I told them I wouldn’t give away any spoilers, and I won’t here either. But I have to tell you, this movie is FUN. A familiar story. Kind of. This is a character and story you think you know, but there are still plenty of surprises. When I got home from the film I told my kids that they would get to see how Han Solo befriends his mighty future copilot Chewbacca. And they would see Han meet the notorious gambler Lando Calrissian and board the Millenium Falcon for the first time. And that infamous Keseel Run? It’s all on-screen. Does Alden Ehrenreich live up to Han Solo? YES! Yes, he does. Like a lot of Star Wars fans I was most worried about somone playing a young Han Solo. But my Alden does a fantastic job. He captures the lovable roguishness of Han Solo that we all adore. But Han isn’t the only stand-out character in this cast. Lando, played by Donald Glover, is hilarious. Qi’ra, played by Emilia Clarke, is endearing. And L3-37, played by Phoebe Waller-Bridge, could be my new favorite droid. Will you get every single Han Solo question answered? No. But you will see Han Solo’s home planet Corellia, meet his first love, and so much more. SOLO: A Star Wars Story is the first movie to feature Chewbacca in a lead role. 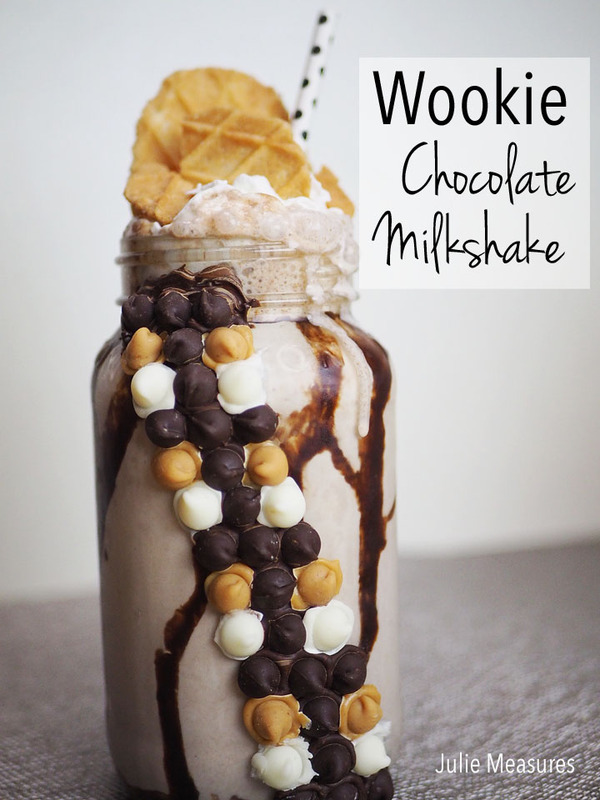 And for that, I thought it was the perfect opportunity to make my own Wookie Milkshake. 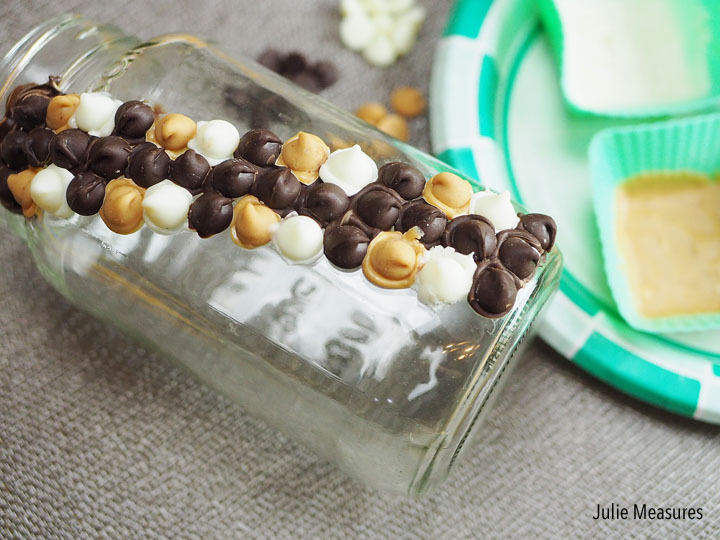 It’s a sweet treat to tide you over until you see the movie! Or afterwards, as a celebration of the fun you just had. 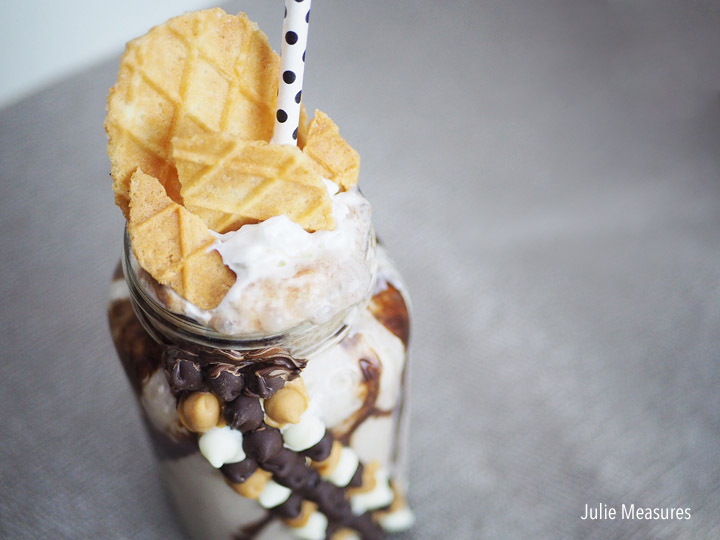 To create my Chewbacca shake I’m using a large mason jar. 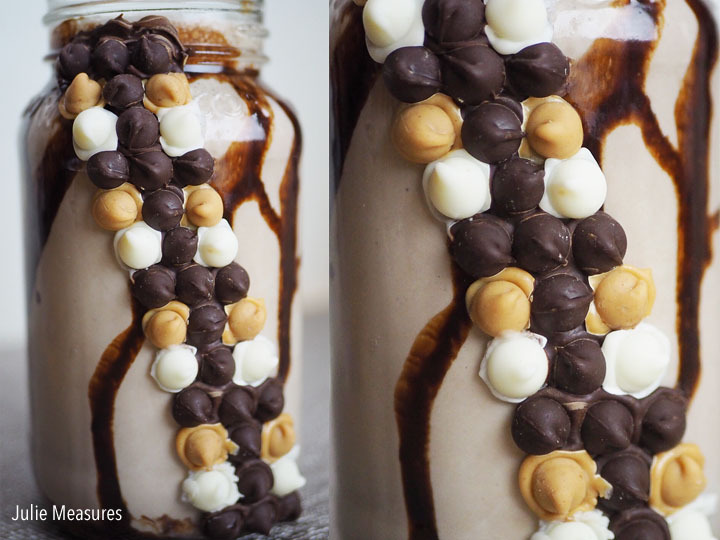 The shake really starts with decorating the jar itself. 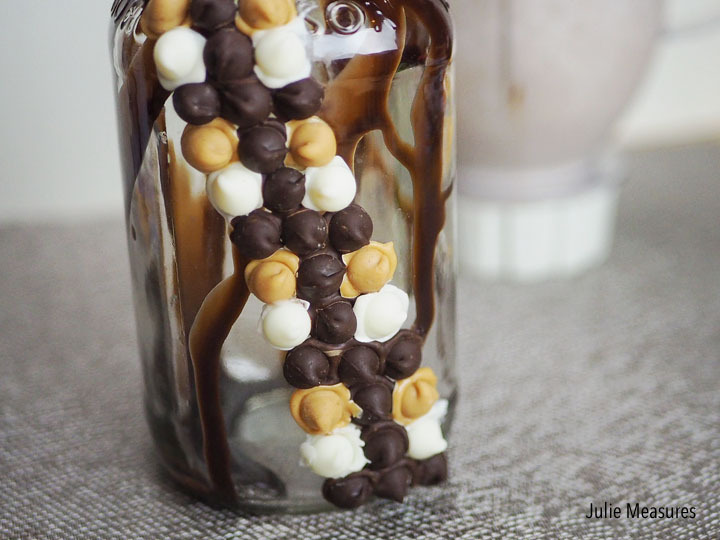 I used milk chocolate, peanut butter, and white chocolate chips to create an edible version of the bandolier, or utility belt, that Chewbacca wears in the movie. The belt is three chips wide, and runs at an angle across the front of the jar. The middle chip is always chocolate, but the exterior chips alternate in order between flavors. I melted a handful of each type of chips in a silicone baking cup. I used those melted chips to attach the solid pieces to the front of the jar. Once my edible belt was attached I blended up my chocolate shake. I learned from my Dad how to make homemade chocolate shakes. Pick your favorite vanilla ice cream, top with chocolate syrup, and then add milk to get the consistency desired. 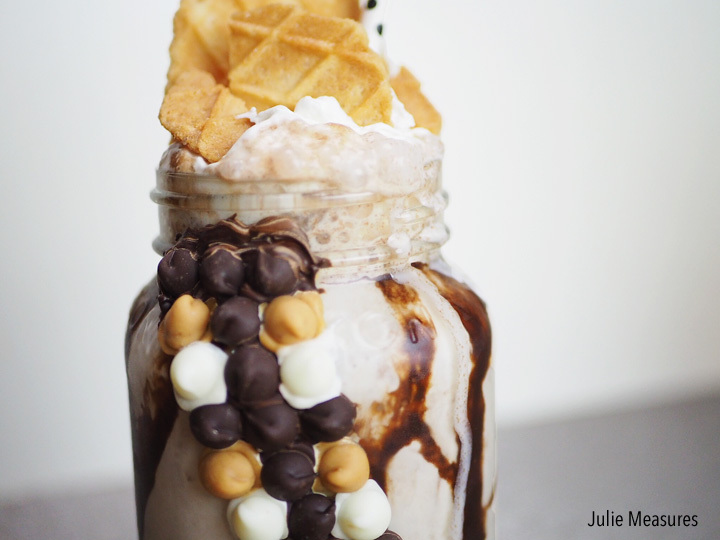 After making my shake, but before pouring it into my jar, I drizzled the inside with some extra chocolate syrup. Then I poured in my milkshake and my wookie inspired shake was almost finished. It just needed a topping. I picked up some waffle cookies at the store, because waffle + cookie = wookie. 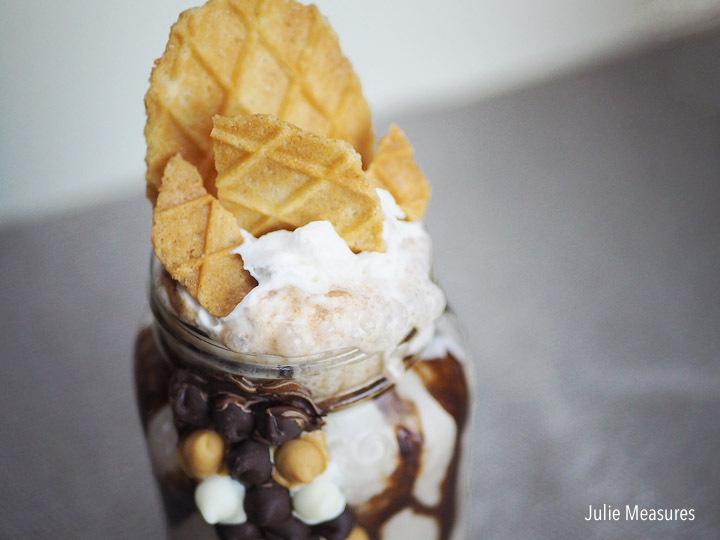 I added some whipped cream to the top of my wookie shake and then added in some waffle cookie pieces. My Wookie Shake was ready to drink! My friends Debra and Elayna were on the red carpet for the Solo movie premiere. 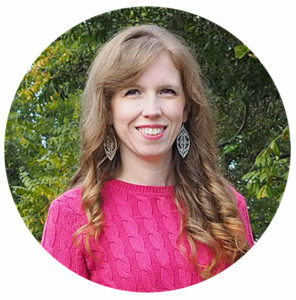 Read about their experiences!